The Grand Palace is perhaps the most famous in Bangkok. You travel to behold the giant gold-Buddha located in the same area called Wat Po. Once inside the area, you can also look at these amazing sights. Is completely covered with gold tiles and contains Buddha relics. Also called emerald-Buddha’s temple was built by Rama I in 1785, the temple is a representation of the royal temple in Ayutthaya (Thailand's former capital) and the Grand Palace is the main attraction. Is a greenish building with a pyramidal spire in Thai Style, notice the nice doors with nacre. On the outside on the walls you see "Garudor" (mythological bird) and in each corner there is a Buddha figure in Indonesian Borobudur style from 1300's. Miniature model of Angkor Wat in Cambodia are on display at the Grand Palace. Sitting in meditation posture on a 11 meter high throne is made of one single piece of jasper (a type of quartz) and measures 66 cm in length and 48.3 cm in width It sits at the top because it is the temple's main Buddha. Originally manufactured in India, and it has been in Angkor Wat and Sri Lanka. Sometime in 14004 it was hidden in an ancient pagoda in Chiang Rai and were covered with a layer of plaster probably because the enemies would not find it and steal it. In 1435 lightning struck the bottom of the pagoda and then the figure was discovered. First, they brought it to Lampang and in 1468 Chiang Mai and there remained the next 85 years. Then it was transferred around at many different places in Thailand until Rama I in 1784 brought it to Bangkok where it have been sense then. Rama 1 had also manufacture three robes to the figure so that every four months could change costume on the Buddha. A new costume for each of the YTR seasons, the hot, the cold and rainy season. This tradition is maintained still. Above the altar is the golden Buddha Phra Chai Lung Chang, as the various kings brought with them where they went to war. In addition, all in all ten standing Buddha figures that everyone has dedicated various kings, queens, princes and princesses. The most interesting are the two large Buddha figures that are under the umbrella of nine layers (number nine symbolizes kingship) They are 3 meters tall in bronze and covered with pure gold. The walls are decorated inside with frescoes describing the life of the Buddha. On the south wall you see the Buddha's birth. Opposite the altar (on the east wall) shows how Buddha get enlightenment under the Bodhi tree. On the north wall you see Buddha as a missionary, among other things youll see his first sermony at Sarnath. Even Buddha's ascent to Nirvanais reproduced. Behind the altar is the medieval worldview produced. When you come out, you see behind the temple a statue on a marble pedestal. The figure represents a hermit who is knowledgeable in the art of healing. Above the figure is a cylindrical stone that was used for cow medicinal herbs on. Even today, people come to the statue to pay homage to the hermit which they believe can cure them. Is an octagonal top, ending with a Prang. The building is beautiful engraved on the doors and windows and is decorated with porcelain mosaic. Inside, there are Buddha figures that are said to affect the weather, Thats why they are taken out every year in May in connection with plowing ceremony at Sanam Luang, here we leave the temple area and enter the palace grounds. This temple was built in the Western style of King Rama V to his son (The style is western) It was in this palace that the current king's brother (King Anada) was murdered years in 1946. Built by Rama II, the monks used the edifice when they would mix the holy water used in special ceremonies. In the mixture the king's bathwater was included. This is the first large building on the right. Above the entrance are two Chinese stone lions, which came with Chinese merchants for approx 200 years ago. The statues served as ballast in the Chinese junks when they came easily loaded into Thailand. When the junks were going home again, they were stuffed with rice and the statues were left and used as decoration in different places in this area and in Wat Po. The entrance door is a beautiful gilded lacquer work. This form of decorative art can still be seen in Chiang Mai. 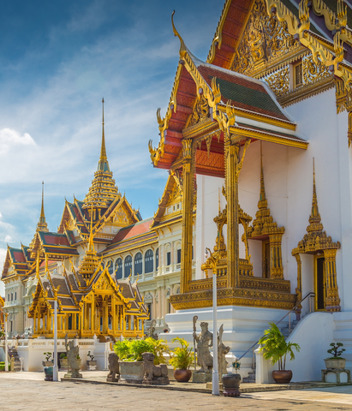 The palace is built in Thai style by Rama I and was previously Thailand's highest court. Today it is used for various ceremonies among others when the Prime Minister will receive their insignia from the king. At such ceremonies they hide the throne behind a curtain so that the king unseen can sit down. At the sound of a fanfare they pull the curtain aside and the King is shown in full canonicals. Behind the throne with the white umbrellas with nine layers is an even greater faith that carries a ship. On each side there is an umbrella with seven layers. (Number 7 symbolizes the queen's dignity 9 kingship) The throne has been built by Rama III and is still used today at the royal ceremonies. Please mark the ceiling, which is decorated with small and big stars in a lovely mix of both Indian and Thai style. This is the neighbourhood where all the king's many wives lived and the king was the only man who was allowed to stay there. Has large glass windows. The red wooden frame used to the king's elephant when waiting for the king to come ride on it. Is a small thee pavilion Thai style. Observe that this pavilion is carved in one piece from a whole teak plank (1.5 meters wide) as wide plank teak is quite impossible to find in Thailand today. Built by Rama IV in 1867 as a three-story building in a mixture of Thai and Western architecture. The roof is in pure Thai style while the rest of the building is the spirit of the Italian Renaissance. The hall is used for royal receptions. On the lawn in front of a variety of beautifully trimmed dwarf trees that are over 100 years old. Built in 1789th building burned down shortly after finishing. But it was quickly rebuilt. It is now used for storage of furniture, for example. a pickled pearl throne that belonged to Rama 1 of the throne is a white umbrella with nine layers. In the East Wing you find the king’s bed with nacre. Note the bed legs where all have nine toes each. Grand Palace Bangkok is an experience. Flights to Bangkok can be done with several airlines with several flights a week from Scandinavia.